2014 Reissue - 180 Gram Audiophile Black Vinyl. 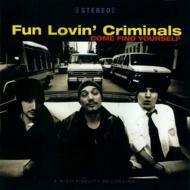 Originally released in 1996, Come Find Yourself is the debut album by New York based alternative band Fun Lovin' Criminals. Come Find Yourself includes the hit singles "The Fun Lovin' Criminal" and "King Of New York". The biggest hit on the album is "Scooby Snacks", with its awesome video inspired by Tarantino's Nouvelle Violence films.